Sneaking in a shopping trip during lunch, my co-worker and I found this cute little cafe just outside the SF Shopping Center. I was initially looking at the falaffel sandwiches, but what is this? They have breakfast! Breakfast for lunch is always a preference of mine. Cafe Moz looks like your typical cheap take-out lunch place for the busy professional, but if you really sit down and enjoy the meal, you’d be pleasantly surprised. It seems like Cafe Moz serves 2 different kinds of food – Mediterranean and breakfast. An odd combination, but it works. The service is very friendly. The server could’ve passed for borderline flirtatious, but hey, I won’t complain. Good service and good food is all I ask. My coworker even forgot her leftovers at the table and the server chased her out the door with her doggie bag. 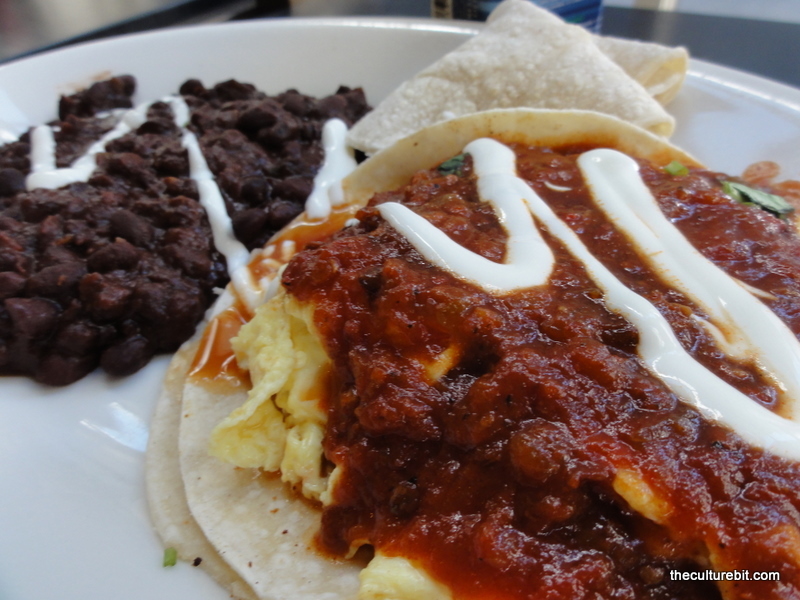 Huevos Rancheros – I cannot turn down huevos rancheros. It’s a good brunch plate because it embodies elements of both breakfast and lunch. This common breakfast plate consists of hearty black beans mixed with fluffy scrambled eggs, salsa and chewy corn tortillas. I added a few douses of Tabasco for a good kick. One thing I look for in a good huevos rancheros is chewy tortillas. Soggy tortillas are no bueno. The reason why I’m giving this 4 clubs rather than 5 is because I think they use a jarred salsa rather than a fresh one. Nothing wrong with that, but I’d appreciate it more if it was made from scratch.